Today I went out to a local homeowners association to give them some pointers on proper pruning. We had cleaned up all their trees last winter and now the trees need a little more work. We talked about a lot of things, and I answered many questions. In this post I want to show you how to properly remove a branch. 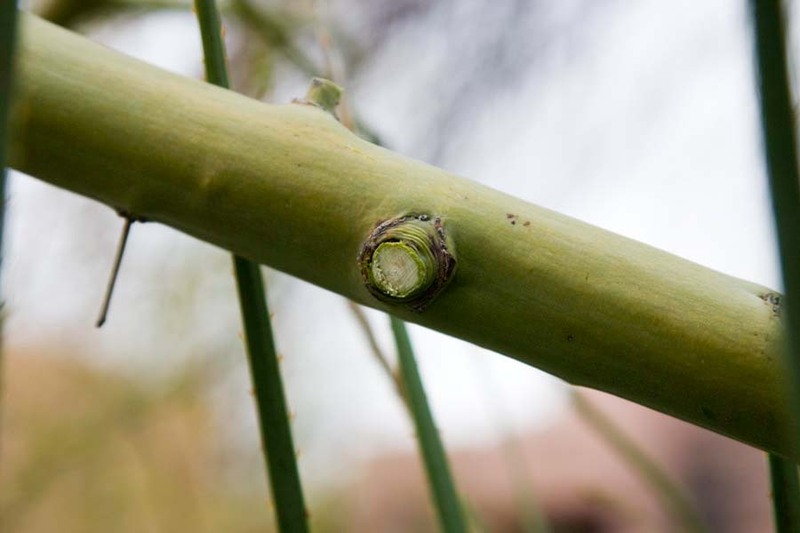 The ideas presented in this post are adapted from the American National Standards Institute (ANSI) A300 Pruning Standards. These standards are not some kind of law – nobody is going to arrest you if you break them! They are based on extensive research and experience. When followed they should result in the best plant health and longevity. 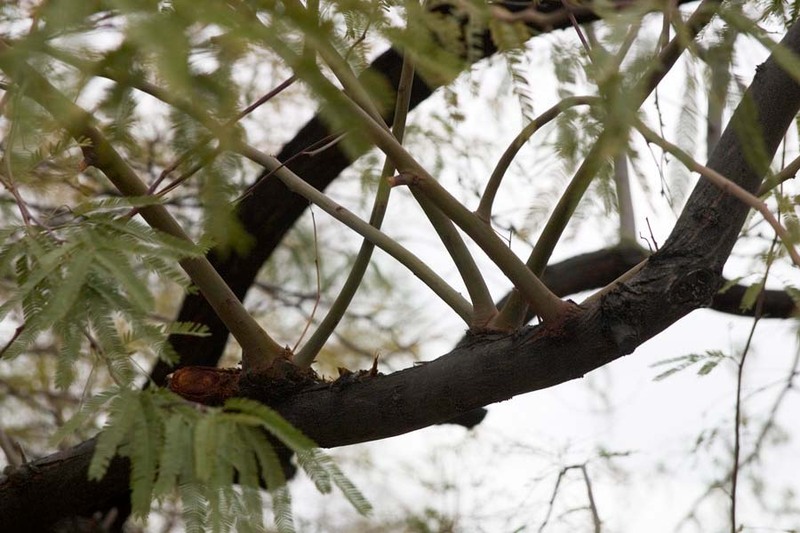 Where a branch is attached to its parent branch there is a structure called a “branch collar”. The branch collar’s tissue is part of the parent branch. Your goal in cutting off a limb is to get as close to the branch collar as possible WITHOUT HARMING IT! This will result in a cut that can be “compartmentalized” by the tree – the decay will be walled off and spread no farther. If the branch collar is cut, the damage will be able to spread easier and will not heal as quickly. 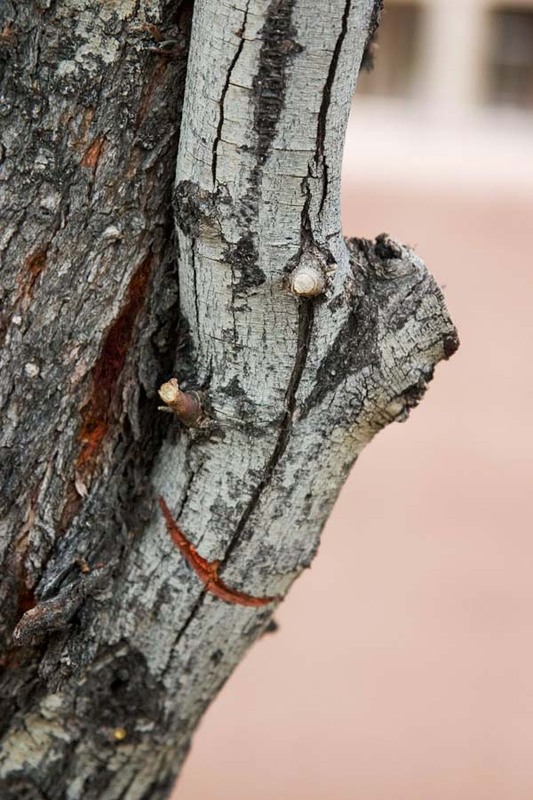 If too much of the branch is left (a stub), it will be harder for the tree to heal over which leaves a way for disease and pests to gain a foothold in the tree. 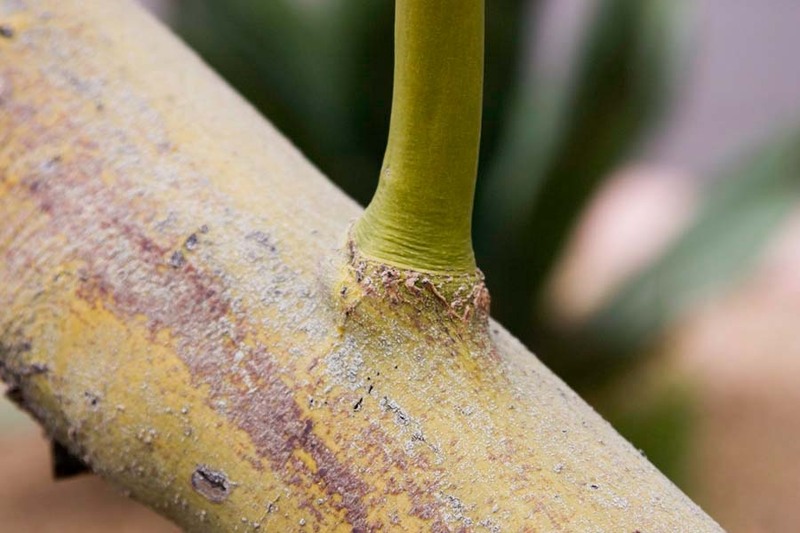 Palo Verde branch collar, right at the base of the smooth green shoot. Completed cut - branch collar intact! This cut could have been a little smoother – probably dull pruning shears, or improper angle. Pruning shears are the best thing to use for small branches, loppers for larger branches, and pruning saws for branches too large for the loppers. Chainsaws have their place, but it’s easy to get carried away with them. They are also dangerous if you are not properly trained and using all the correct Personal Protective Equipment (PPE). Their use is better left to professionals. These examples show how to prune of a branch that is leaving it’s parent branch at about 90 deg. What about a branch that is more narrowly attached – almost parallel to its parent? Below is a picture of such a branch with a line scribed where we would like to make the cut. It is important to not cut the parent branch! It is hard to tell exactly where the crotch is when two branches are this tight together. I could probably have cut this a bit lower, but I am sure the tree can heal over this cut. More often, we need to look at the tree and figure out what to remove. The first things I usually cut off are prior improper cuts & stubs, then suckers, and finally crossing branches. There is a guideline for maximum trimming – 20 to 25% per calendar year. We need to stay under that percentage and can keep taking off problem branches until we reach that threshold. Usually when we have not been caring for a particular tree for very long, we can’t get all the problems fixed without going over. Then it will be a multi-year effort to fix the tree. We still work through it in the order stated above. 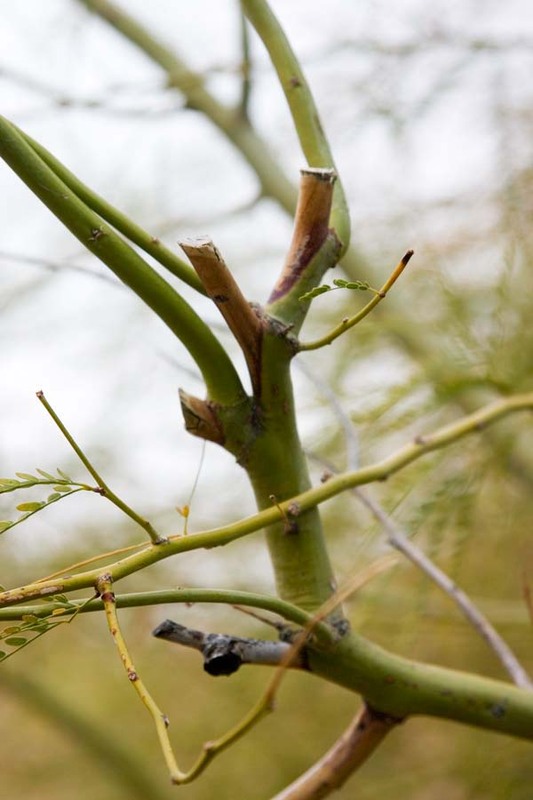 Here is one of our Palo Verde branches that had been trimmed incorrectly in the past (many times based on its appearance). This branch stuck out toward a road in the property and had just been whacked off wherever it was convenient. None of the cuts were back “to the fork” or branch collar and the stubs have died (see the brown, dead bark?). Rather than try to deal with all this mess, the entire branch was removed back to the trunk. Trees look a lot better without stuff like this in them! Suckers or watersprouts are vigorously growing branches that shoot up (usually) through the middle of a tree. They are normally a reaction to overpruning (more than 20-25%). 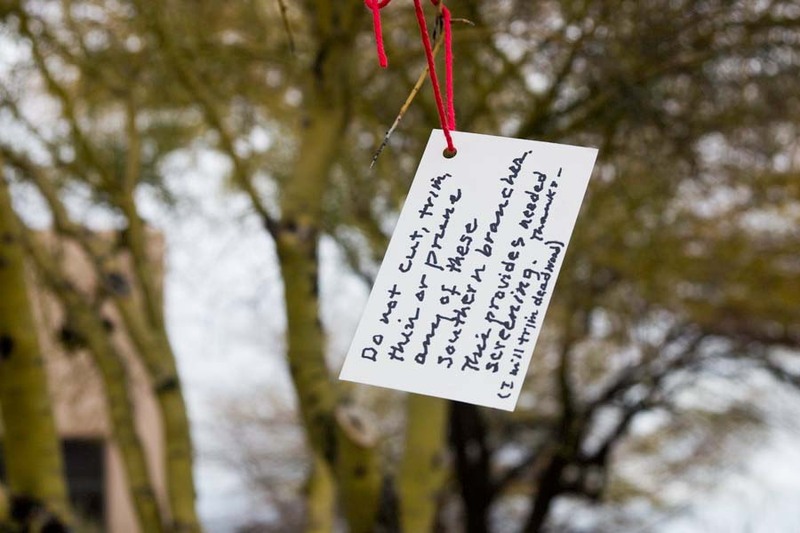 They are a mixed blessing for the tree. The foliage on them manufacturers a lot of food for the tree. They also (as with all branches) increase the diameter of the parent branch at its point of attachment. Continually stripping off suckers can result in a long whippy limb that can’t sustain the weight on its end (this is an improper pruning practice known as “lion-tailing” – I’ll try to post a picture sometime). I usually cut off all the suckers low on the tree when we’re hired to trim a tree. On my own trees I leave some as “temporary” branches to help build branch diameter, removing them as they become about the size of your little finger. Enough for now! We also talked about Mistletoe – I’ll post something on it soon. Monday we start a job removing two large California Fan Palms, without a crane! 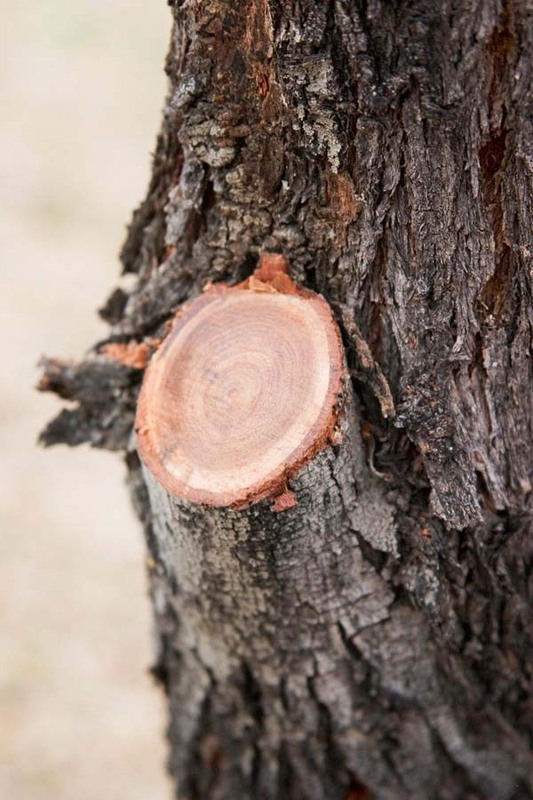 On this blog I hope to share with you proper arboriculture procedures, plant health concerns and safety protocols as well as past and current projects. If you have a question about a certain plant or process, first search the archives. Drop me a line (through the About/Contact tab, above) if you can't find anything - I will try to address your topic in a future post. If you're in our area and need tree work done, please email me and I'll be glad to meet with you!